Easily save space on your bar and find what you are looking for fast! Display the bottles on your bar in style with this spacious liquor bottle display! You’ll be amazed at how much space you’ll save when all of your liquor stays in order and stays accessible. With two levels, these durable bar bottle shelves fit up to 18 bottles and gives you lots of room to show off your stuff. This shelf is made tough, from solid acrylic, so it doesn’t bend or buckle – even with tons of bottles on top. Throw some lights under this translucent shelf for a classy look that brings adds appeal to your bar decor. Made of heavy, translucent acrylic. Will not flex or bend. Decent price for a good back bar shelf. 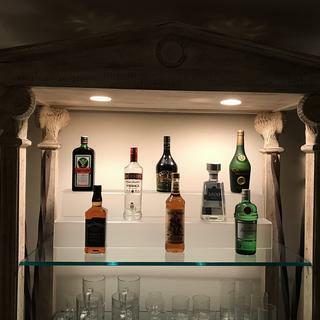 I ordered the 34" frosted 2 tier shelf to put inside a hutch the we turned into a bar and it looks beautiful especially when a put a thin 36" LED light under it. Works great on our back bar holding 8 bottles of alcohol on each shelf. While the shelf seemed pricey, it was a perfect fit for my needs and an excellent way to display liquor bottles. Thank you for your feedback. Your bottle display looks awesome! Quoted from the text of the description: "This shelf is made tough, from solid acrylic, so it doesn’t bend or buckle – even with tons of bottles on top." But that is not what I got. The bottom was cut so poorly that the whole shelf rocks (see the picture). If this had been a stable shelf, I would have given it five stars across the board. We are sorry to hear that the shelf you received wasn't cut straight. Our customer care team has received your email and will work with you to replace the shelf you ordered with one that is cut properly. Feel free to call our customer care team 877-636-3673 or email us at customercare@kegworks.com with any further questions or concerns. Thank you for shopping at KegWorks! Appears to be quality construction and is the size I need. Comparable LED lit models are overly expensive, and I can light this for a fraction of the cost. Looks nice and I think it will fit perfect in our hutch we are turning into a bar. Can the depth be trimmed down? I have a 7.75" width shelf but this shelf is 8.5". No. You can’t trim it to a narrower width. I think you’ll have to go with a single shelf. No. You can't trim the depth that way it is designed. No, these cannot be trimmed to fit a smaller depth.